Couple of weeks back I was invited to an exclusive dinner at the newest restaurant in Grand Hyatt-The Collective. Since the time I got the invite I was quite intrigued by the different concept and couldn’t wait to go and find out for myself what The Collective had to offer. What to expect from The Collective? The Collective is the new Food Emporium. It features Four different settings- Levant Emporium, Bombay Cafe (specialized in Parsi cuisine), Grill Bar and Boutique Bakery. There is also a Beverage Bar for hot and cold beverages. You can have your pick from any of the stations for a set price. An a la carte option is also available. There is no fixed menu as such and you can expect something new every day. The Collective is located at the lower lobby level of Grand Hyatt’s indoor tropical garden. The restaurant is very spacious with four different settings-The Setting of Levant Emporium has Levant inspired decor, where as the vibrant decor of Bombay Cafe has a Parsi touch to it. The ambience is cosy,elegant and welcoming. The decor is modern and classy. Loved the beautiful furniture, bright lighting and wonderful tableware. I especially loved their amazing crockery, it was such a delight to eat in those colorful plates and bowls. Now let me start my food journey. My partner this time was my sister. After being seated in a comfortable corner, we were offered drinks. My sis had the Pomegranate Iced Tea and I had the Lemonade. 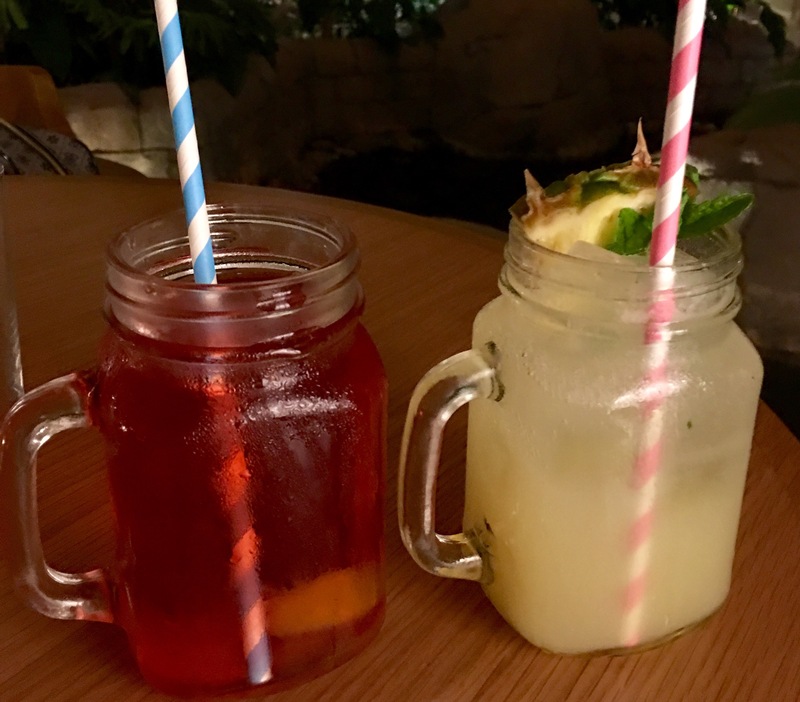 Both the drinks were refreshing. We liked Lemonade better than the Pomegranate Iced Tea. Their beverage list is amazing-they offer both alcoholic and non alcoholic beverages. We also got to try Moroccan Tea, Masala Tea and Caramel Espresso Lassi. 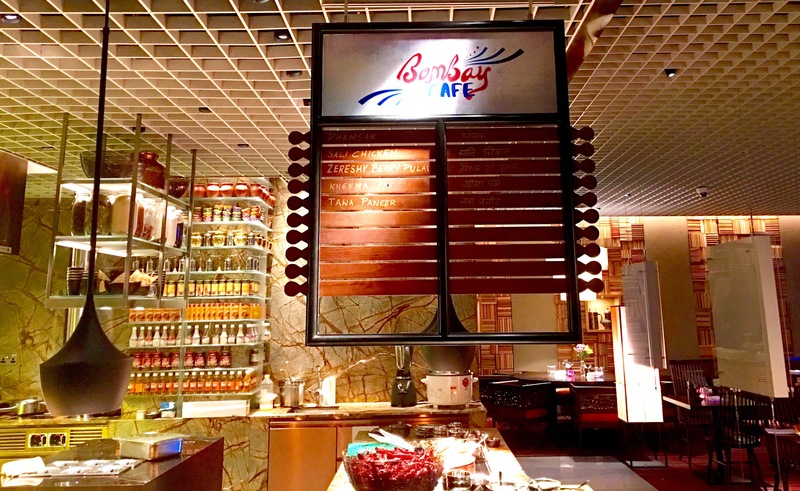 Our first destination in our food journey at The Collective was Bombay Cafe. This is the first time in Dubai that a restaurant inside a hotel is offering Parsi food. There are just a couple of small Parsi restaurants in Dubai. Bombay Cafe offers most of the popular Parsi food from Dhansak to Kheema Pav, Kebabs,Fish and Stuffed Aubergine. What I liked about the Parsi food offering at The Collective is that it is authentic, fresh and tasty. It took me back in time to my Bombay days, where I would frequent Parsi cafes. Our next stop was the Levant Emporium. We tried their fresh salads and cold Mezze like hummus, moutabel, Shanklish, stuffed vine leaves and Babaghanoush. We especially loved the basil hummus and the paprika hummus. 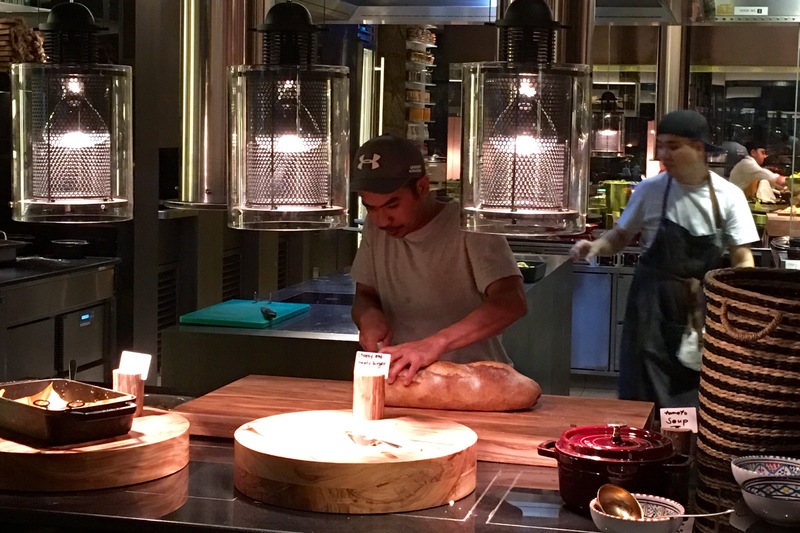 All their bread are freshly baked in their kitchen. The Turkish bread known as Pida is a must-try at the Levant Emporium. We also tried different types of Manakish. There was also flavorful Tagines, Shawarmas and mixed grill. We didn’t spend much time at the Grill Bar as we are vegetarians and the Grill Bar mostly comprised of meat dishes and seafood. The Grill bar had everything from roast beef, roast chicken to grilled crabs and tiger prawns. Our last stop was the Boutique bakery. It is the dessert station. The selection of desserts is massive. They make their own gelato, make sure to grab one of those yummy gelato when you visit The Collective. We tried their freshly made pancakes, waffles and crepes. We tried many cakes and pastries. 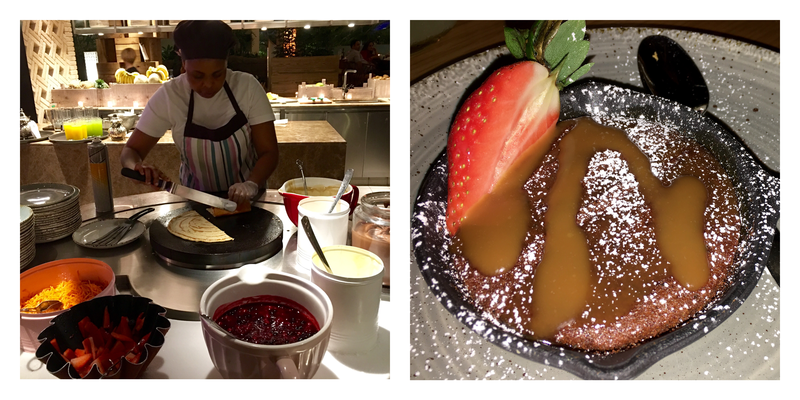 Sticky Date Pudding, Banoffee pie, chocolate cake, Konafa and chocolate baklava were some of our favorite desserts. We also liked the dark chocolate fudge and milk chocolate fudge. Yes, they have a chocolate fountain too. 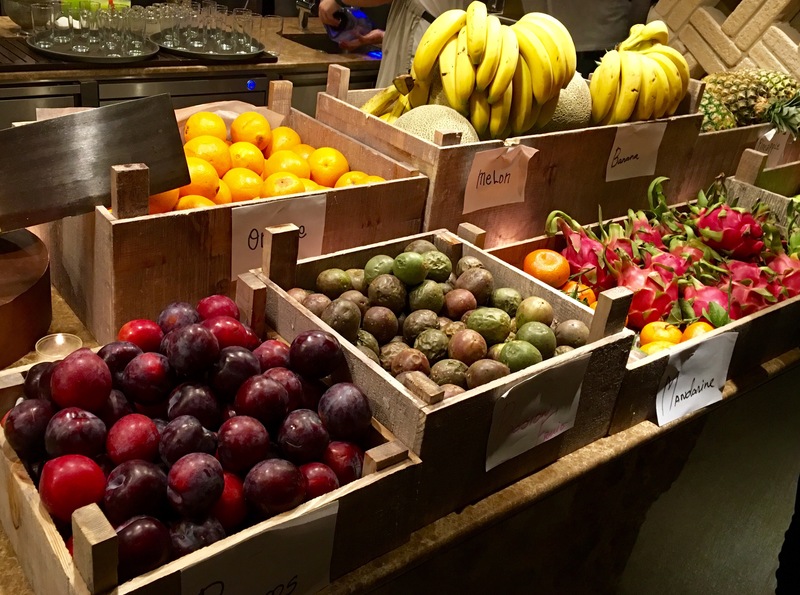 There was also a huge counter with a wide range of fruits. A good option to those who want to indulge in guilt free desserts. The Collective serves a mix of different kinds of cuisine. Each and every section offers unique and delicious food. I liked the fact that all the dishes that were offered were made using freshest of ingredients. They offer breakfast, lunch and dinner. They also do Friday brunch. Overall we had an amazing experience. 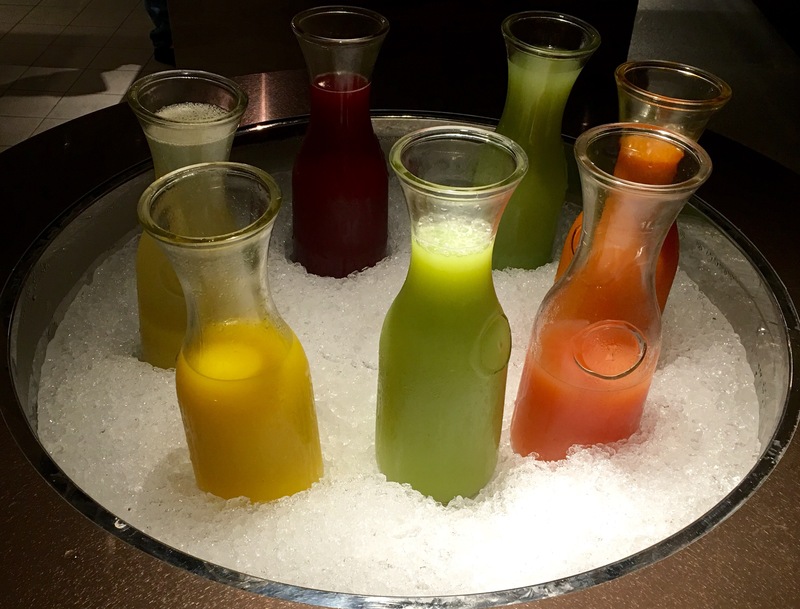 The food is excellent, the service is impeccable and the atmosphere is inviting. It is a family friendly place. 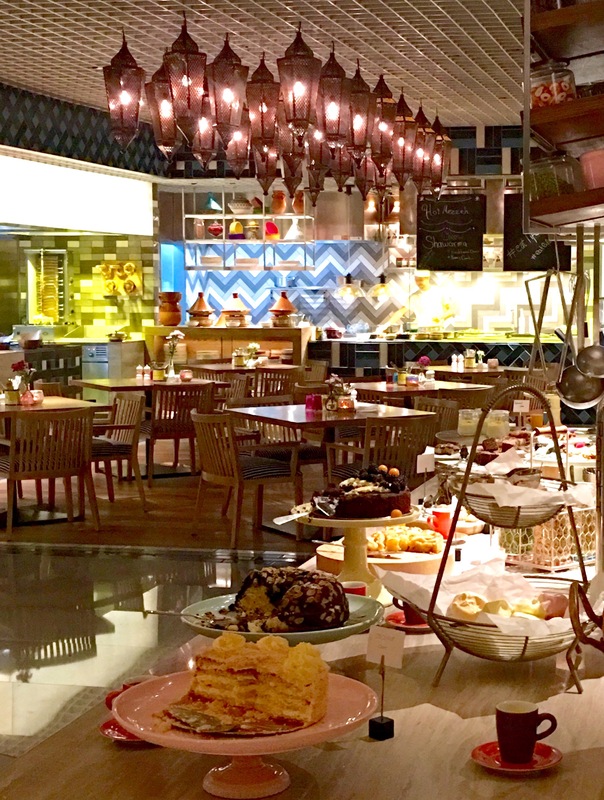 Dubai’s flourishing dining scene got better with the addition of The Collective. 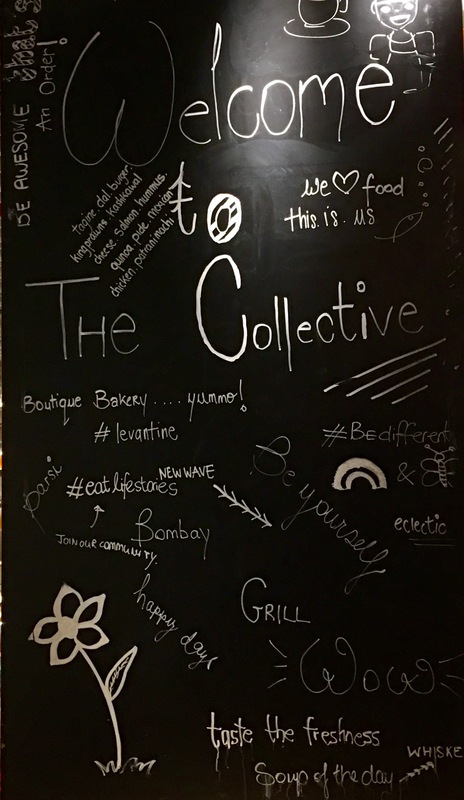 A culinary journey to The Collective at the Grand Hyatt is a must-visit destination to every food lover. It is absolutely worth visiting.